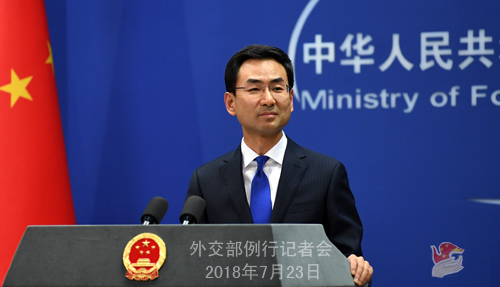 At the invitation of State Councilor and Foreign Minister Wang Yi, Jeremy Hunt, Secretary of State for Foreign and Commonwealth Affairs of the United Kingdom of Great Britain and Northern Ireland (UK) will pay an official visit to China and hold the 9th China-UK Strategic Dialogue on July 30. Q: Could you give us more details about this visit? This visit is taking place in just less than one month since former Health Secretary Jeremy Hunt became Foreign Secretary. What is China's expectation for this visit? A: During Foreign Secretary Jeremy Hunt's visit, Premier Li Keqiang and member of the CPC Central Committee Political Bureau and Director of the Office of the Foreign Affairs Commission of the CPC Central Committee Yang Jiechi will hold meetings with him on separate occasions. State Councilor and Foreign Minister Wang Yi will co-chair the Strategic Dialogue and exchange views on bilateral relations and international and regional hotspot issues with him. The China-UK relationship is developing with sound momentum now. At the beginning of this year, Prime Minister Theresa May paid a successful visit to China and held a new round of the Annual China-UK Prime Ministers' Meeting and the leaders of the two countries reached important consensus on advancing the "Golden Era" for China-UK bilateral relations. Foreign Secretary Jeremy Hunt is coming to China to hold the China-UK Strategic Dialogue shortly after he took office, which showcases the high importance the UK attaches to its relations with China. Likewise, China also highly values deepening its cooperation with the UK in various fields. We believe this visit will strengthen our political mutual trust and promote greater development of the China-UK global comprehensive strategic partnership for the 21st century in the new era. Under the current international circumstances, it is imperative for China and the UK, both of whom are the permanent members of the Security Council, guardians of the international order and champions of the free trade, to send out positive and upbeat messages of upholding the rule-based international order, building an open world economy and opposing protectionism and unilateralism. Q: We noted that President Xi Jinping have paid visits to such countries in the Middle East and Africa as the UAE and Senegal these two days. One thing these countries share in common is that they both signed cooperation agreements on the Belt and Road Initiative with China. Do you have more details? A: You are right. During President Xi Jinping's state visits to the UAE and Senegal, China signed relevant cooperation agreements on the Belt and Road Initiative with the two countries. The UAE lies in where the Silk Road Economic Belt and the 21st-Century Maritime Silk Road converge and is a key pillar state of the Belt and Road Initiative. In recent years, the UAE side put forward the conception of "revitalizing the Silk Road" and expressed its strong will to be a part of the Belt and Road Initiative, making a natural partner for cooperation under the Belt and Road Initiative. When President Xi Jinping was in the UAE, the two sides issued a joint statement, which stresses that the two sides are willing to strengthen cooperation within the framework of the Belt and Road Initiative, secure unimpeded strategic synergy and industrial policy connectivity, deepen industrial capacity cooperation, ensure sound planning, operation and development of the China-UAE Industrial Capacity Cooperation Demonstration Park and other flagships under the Belt and Road Initiative, and promote all-round outcomes in China-UAE major practical cooperation across the board. Senegal is an important African country with unique geographical location. Lying in the most western part of the African continent, it is a key extension of the Belt and Road. When President Xi Jinping was in Senegal, President Macky Sall said that Senegal supports the Belt and Road Initiative and is willing to actively engage in building interconnectivity. The leaders of the two countries witnessed the signing of an array of bilateral cooperation documents on the joint building of the Belt and Road Initiative. President Xi Jinping pointed out that, Senegal is welcome to become the first West African country to sign cooperation documents on the Belt and Road Initiative with China. The two sides will use this opportunity to elevate the level of China-Senegal cooperation to the benefits of the two countries and two peoples. Since the Belt and Road Initiative was proposed less than five years ago, it has been translated from conception and vision into action and reality. A wide range of major cooperation projects have been carried out, forming a strong momentum of jointly building the Belt and Road Initiative around the globe. 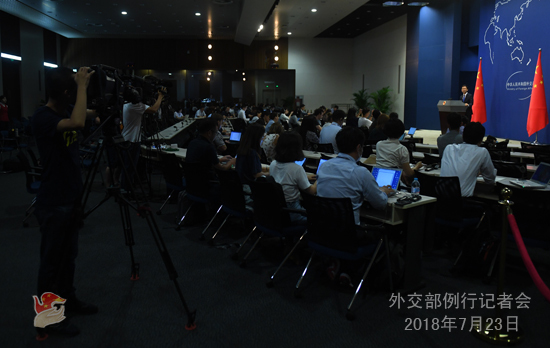 Following the principle of extensive consultation, joint contribution and shared benefits, China will continue to work with relevant countries and international organizations to tap into the potential for cooperation, advance the process of joint building and bring more benefits to this region and promote world peace, development and prosperity through the implementation of the Belt and Road Initiative. Q: President Maithripala Sirisena of Sri Lanka said on July 21 that China has pledged 2 billion yuan to be utilized for any project in Sri Lanka. Can you confirm that? What is China's purpose for providing this fund? A: China and Sri Lanka enjoy traditional friendship. Over the years, China has provided assistance to Sri Lanka within our best capacity under the framework of South-South cooperation in accordance with its development needs, including such livelihood projects as housing, hospitals and roads, with a view to promoting local socio-economic development. No political string is attached to this assistance at all, and it serves and benefits all people in Sri Lanka. Q: The US has threatened to impose tariffs on up to 500 billion worth of Chinese goods and accused China of manipulating its currency. What is China's response to this? A: Regarding the trade war willfully ignited by the US, China doesn't want a trade war, but is not afraid of and will fight one when necessary. This position remains so firm and clear. I am not going to elaborate on that since it was stated many times previously. I only have two more points to make: first, threats and intimidation will never work on China. 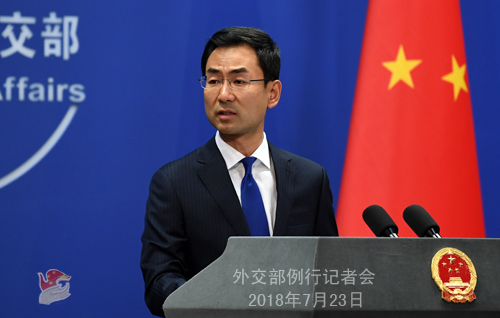 We are capable of and confident in safeguarding the interests of the Chinese people; second, we advise the US to remain calm and handle the relevant issue with a rational attitude. As to the the issue of the RMB exchange rate, I would like to refer you to the competent department as they will give you more details. What I could tell you is that, the RMB exchange rate is mainly determined by market supply and demand. It floats in both ways, meaning that there are ups and downs. At present, the good fundamentals of China's economy provide strong buttress for its RMB exchange rate to remain generally stable. Besides, I would like to reiterate that China has no intention to spur its export through competitive currency devaluation. This is our consistent position. Q: US Treasury Secretary Mnuchin said at a press briefing that the US tariff policies are not protectionism. It is about the United States wanting fair and free trade. Anytime that China wants to sit down and negotiate, the US team is available. What is your response? A: The Spokesperson of China's Commerce Ministry has given official responses to relevant issues on China-US trade talks. I just want to stress one thing: credibility comes before negotiations. Q: What is your comment on the US Treasury Secretary Mnuchin's comments saying that the US is closely monitoring the recent weakness in Chinese yuan to see whether it has been manipulated? A: Like I just said, if you want a more detailed answer, you need to ask the competent authority, that is, the People's Bank of China. What I can say is that the RMB exchange rate is mainly determined by market supply and demand. It floats in both ways, meaning that there are ups and downs. At present, the good fundamentals of China's economy provide strong buttress for its RMB exchange rate to remain generally stable. Besides, China has no intention to spur its export through competitive currency devaluation. Q: Donald Trump tweeted that if Iran threated the US, it would face consequences the likes of which few throughout history have ever seen. He also warned them to be cautious. What is your comment? A: China always believes that all countries should develop their ties on the basis of the Five Principles of Peaceful Co-Existence and other universally-recognized basic principles guiding international relations, and resolve disputes and issues through dialogue and consultation. Q: How does China evaluate the impact of the vaccine scandal on global export of drugs and food products? A: It seems that this is not a diplomatic question. You may have noticed that Premier Li Keqiang has made an instruction on this case. As far as I know, the relevant departments in China are speeding up investigation into this case. Last but not least, I have something that I know all of you would be very interested to know. I have been asked many times privately that when our regular press conference will take a summer break. I know this is of your immediate interests. So I would like to announce that date here so that you can make some arrangements accordingly. The regular press conference of the Foreign Ministry will be adjourned from August 6 (Monday) to August 17 (Friday). It will be resumed on August 20 (Monday). During the recess, you can reach the Spokesperson's Office via phone or fax.